, a French academician, and a man of genius, was descended from an ancient and distinguished family, and born at Beziers in 1624. His mother, who was left a widow very young, brought him up in the protestant religion, and sent him to Castres to learn the belles lettres of Morns, or More, a learned Scotsman, who was principal of a college of the protestants at that place, and father of the famous Alexander More. At twelve years of age he was removed to Montaubon to study philosophy; and thence to Toulouse, where he applied himself to the law. 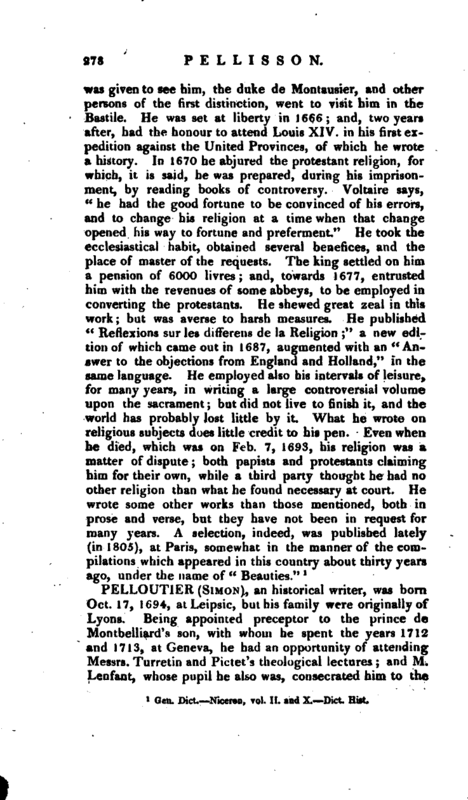 He acquired a good knowledge of the Latin, Greek, Spanish, and Italian languages; but his love for the belles lettres did not make him neglect the law, which he studied so diligently as to publish, when he was not quite one-and-tweiuy, “A Commentary upon the Institutes of Justinian,” Paris, 1645, 12mo. 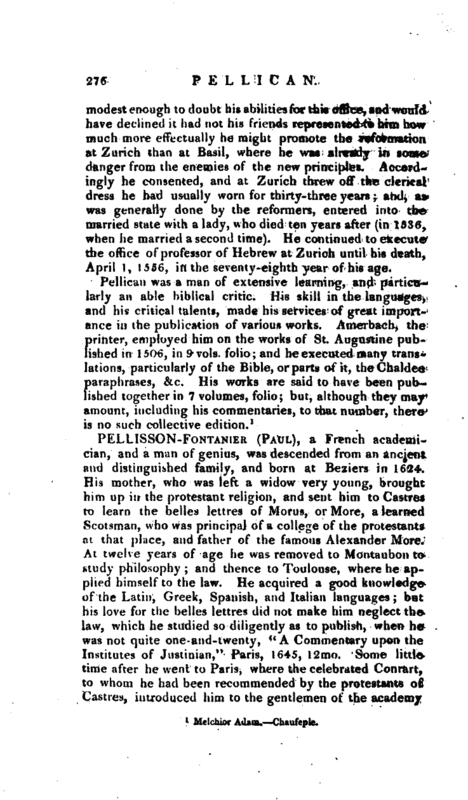 Some little time after he went to Paris, where the celebrated Conrart, to whom he had been recommended by the protestants of Castres, introduced him to the gentlemen of the academy | who assembled at his house; but Pellisson soon returned to Castres, the residence of his family, and applied himself to the business of the bar. He had excited the admiration of all about him, and was going on in a most flourishing way, when the small-pox seized him, and disfigured his countenance so much that his friend mademoiselle de Scudery told him he had abused the common liberty of men to be ugly. Having come to Paris a second time, he had contracted a friendship for this ladv, and for many years, it is said, they did not fail either to see or write to each other every day. 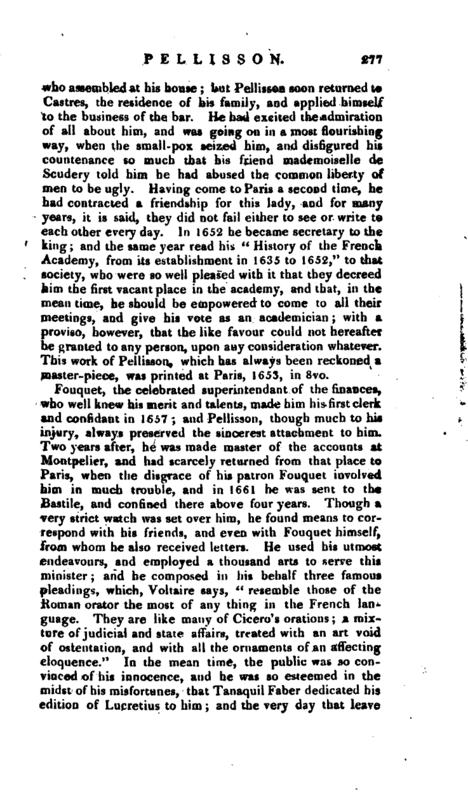 In 1652 he became secretary to the king; and the same year read his “History of the French Academy, from its establishment in 1635 to 1652,” to that society, who were so well pleased with it that they decreed him the first vacant place in the academy, and that, in the mean time, he should be empowered to come to all their meetings, and give his vote as an academician; with a proviso, however, that the like favour could not hereafter be granted to any person, upon any consideration whatever. This work of PtJlisson, which has always been reckoned a master-piece, was printed at Paris, 1653, in 8vo. Gen. Dict.—Niceron, vol. II. and X.—Dict. Hist.